AKIPRESS.COM - Former frontier market darling Mongolia has had a tough time in a world of low commodity prices, with its government struggling to make ends meet, but a spike in global coal prices could see the country stage a comeback, reports CNBC. The mineral-rich country had seen double-digit economic growth as high as 17.3 percent in 2011 at the height of the mining industry boom. Subsequent declines in global commodity prices eroded those gains, with ratings agency Moody's predicting 2016 growth to be flat and only a 1 percent uptick in 2017. But following reforms in China this year to rein in overproduction, and growing demand in Asia Pacific, coal prices soared. In November, Reuters reported premium coking coal prices in Australia had jumped to $289.30 a metric ton, up from about $85 at the beginning of June. Coking coal is a key component in steel production. The recovery in prices has spurred Mongolia's hopes for a complex restructuring of the Tavan Tolgoi coal mine in the South Gobi desert, a move that would settle outstanding debt to Chinese aluminum producer Chalco Group. An end to the Tavan Tolgoi upset would make it easier to invite new investors such as Chinese state-owned firm Shenhua Group to help ramp up production and shipments to key market China at better prices. "Nothing has changed on the Mongolian side of the border, in terms of quality of the coal, the availability (and) the low production costs," Layton Croft, an independent director at Mongolian real estate business Asia Pacific Investment Partners, told CNBC. "In some cases, the ability to add value by washing the coal and, of course, the short transpiration distances are competitive advantages for Mongolian producers." The development of Tavan Tolgoi, which contains 7.4 billion ton of coking and thermal coal deposits and is largely untapped, hit a series of political and economic roadblocks over the past few years, but the July election of the Mongolian People's Party is expected to ease the way forward. To be sure, global coal demand is expected to remain sluggish, according to an International Energy Agency forecast released this month, noting while China aims to curb production it also is looking at to further develop other power sources. Mongolia's government on Friday held an initial meeting with a private consortium, led by Shenhua, which is in talks to take over development of the Tavan Tolgoi mine from the Mongolian state-owned company Erdenes Tavan Tolgoi JSC (ETT). ETT owns six mining licenses, including one in the Tsankhi section of the Tavan Tolgoi mine that has coking coal deposits, but the company has been saddled with outstanding debt to Chalco. In 2011, the company borrowed $350 million from Chalco and agreed to repay the debt in the form of coal deliveries, according to Reuters. 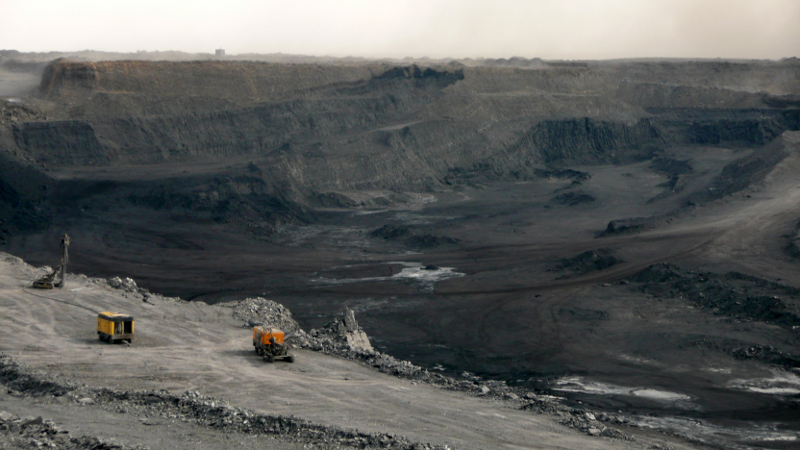 Because ETT is the largest miner in the country, this deal has meant much of Mongolia's coal exports have been unable to benefit from a resurgence in coal prices. With ETT representing a majority of Mongolia's current coal production, private companies have to contend with these low coal prices. "They are effectively being crowded out by the government," Cousyn told CNBC by phone. He said Mongolia was missing out $70 a metric ton, or about $2 billion, in potential revenue if it produced about 30 million tonnes of coal on the assumption coking coal sold for $100 a metric ton on average. For Mongolia's $12 billion economy, that is a significant amount. A representative from ETT told CNBC by email the key focus of the negotiations between the Mongolian government and the Shenhua-led consortium was to come up with a holistic approach to fix current underlying issues. "For ETT, it means to fix its heavily discounted unwashed coal export and to regain commercial freedom through the economics of washing the coal and mining at both East and West Tsankhi," the spokeswoman said. She added that ETT expected to pay off its remaining $96 million debt to Chalco by the end of fiscal 2016. Commentators said the new operating model would unlock the mine's ability to increase its production level and sell at a higher price. It would also lead to infrastructure investments in Mongolia, including the development of a railway that could link into the Chinese rail network and deliver coal to destinations throughout China. The latter benefit, Cousyn said, could ensure the Chinese still bought Mongolian coal even if prices went up, by easing the route of supply. Under the current agreement with ETT, Cousyn said only inner Mongolia - an autonomous, northern region in China - benefited from the lower coal prices because shipments arrived across the border on trucks and was unloaded there for industrial use. "What China wants is a much (bigger) access to natural resources globally at the lowest possible price," he said. Still, politically Mongolia irked China in November after Tibetan spiritual leader the Dalai Lama visited Ulaanbaatar, the country's capital. In response, Reuters said China imposed new fees on commodity shipments at the crossing at Gashuun Sukhait, which is used to export copper from the Rio Tinto-run Oyu Tolgoi mine and coal from Tavan Tolgoi. Meanwhile, the country's short-term economic outlook is expected to remain depressed due to a drop in private consumption and negative impact of exports, according to Moody's analyst Mathias Angonin. He told CNBC by phone the benefits from the development of Tavan Tolgoi will only be realized beyond 2020, when growth is expected to hit 8.6 percent. In the interim, the government has outstanding bonds that are set to mature in 2017, 2018 and 2022, including a $580 million maturity due in March 2017. The bond was issued by the Development Bank of Mongolia, with a government guarantee. "We think the government will have to bear the refinancing risk for that bond and the modes of financing are not ascertained yet," said Angonin. Moody's recently downgraded the Mongolian government's rating to Caa1 from B3, a high credit risk rating, citing increased uncertainty over the government's ability to meet its debt obligations in the near term. The ratings agency said as of September 2016, the country's foreign reserves had fallen to a 7-year low of $1.1 billion. In 2018, the government has a bond repayment of $500 million in January, followed by a 1 billion yuan ($145 million) maturity in the same year, according to Moody's. "The prospects are very favorable in the (Mongolian) mining sector, but the timing is uncertain."